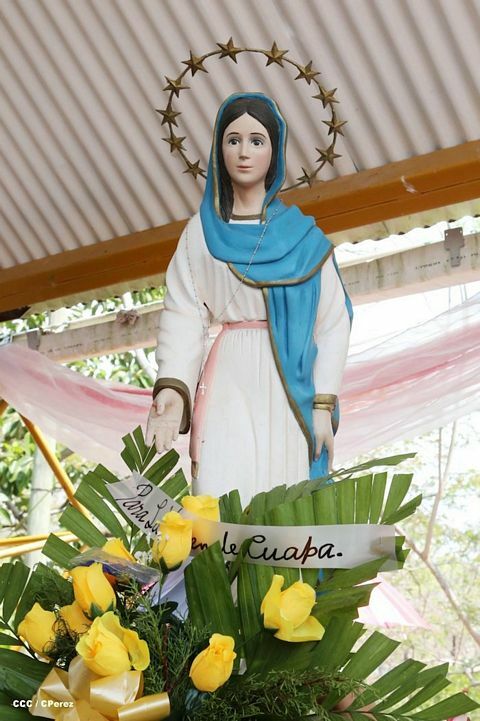 On April 15, 1980, the sacristan, Bernardo Martinez (age 50), witnessed the statue of Mary in the chapel light up on its own. Recently, the sacristy lights had mysteriously illuminated on two other occasions. Thinking that Mary might be mad at him for arguing with others, he set out to seek forgiveness from those people. But they laughed at his story and ridiculed him. He begged Mary to not request anything more of him because it was causing him troubles. He even avoided going near the statue. Bernardo was close to his breaking point both physically and emotionally due to illness, being out of work, and not being able to care for his family well. To cheer himself up, he went to the river to fish. When it began to rain around 1:00 p.m., he decided to sit under a tree and wait. He dozed for a short time but woke with a start and an unexplained fear. He decided to pray the Rosary. By 3:00 p.m., he decided to gather his fish and head home. Returning from this fishing trip on May 8, 1980, Bernardo saw two lightning flashes. On the second flash the Virgin Mary appeared to him. He felt immobilized and could not run or yell. But he was surprised that he felt no fear. He thought that he might just be envisioning the same statue in his mind – and perhaps was dreaming, but when he passed his hand over his eyes and looked again, he saw that she had human skin and eyes that moved and blinked. “She is alive!” he thought to himself – because his tongue would not move to speak. He felt numb – his lower jaw and tongue were stiff as if asleep. His whole body was immobilized – only his thoughts in his mind could be active. She was so beautiful – wearing a long white dress with bare feet resting upon an extremely white cloud. She had a celestial cord around her waist, long sleeves, and a veil of a pale cream color with gold embroidery covering her. She extended her arms and rays of light, “stronger than the sun,” emanated from her hands. The rays touched his chest – and he was able to speak again, so he asked her name. Bernardo is humbled by the Virgin Mary’s presence. “She answered me with the sweetest voice I have ever heard from any woman – sweeter than the softest voice.” He saw her move her lips and say that her name was Mary. He knew she was alive and real because she actually responded to him! M: “I don’t want it (Rosary) prayed only in the month of May. I want it to be prayed permanently, within the family, including the children old enough to understand – to be prayed at a set hour when there are no problems with the work in the home. Mary added that prayers should not be rushed or said in a mechanical fashion. She told him to read the Bible passages that go along with the mysteries of the Rosary. 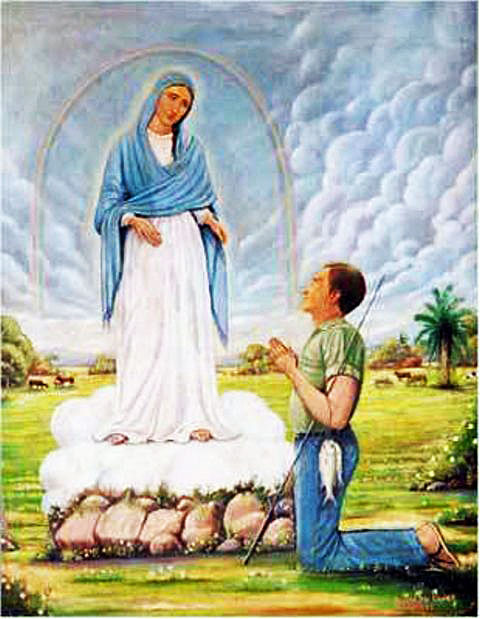 Bernardo was frightened to spread Mary’s message because of the persecution he had endured earlier. He kept the vision to himself for eight days until Mary appeared again. Bernardo described Mary looking upward toward Heaven, and the cloud that held her slowly elevated her. She was in a ray of light, and when she reached a certain height, she disappeared. 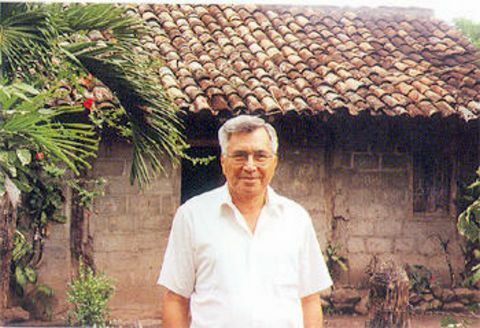 So Bernardo began telling people and his priest – who encouraged him to keep sharing with others what he had witnessed. On June 8, 1980, Mary appeared again, giving him four visions – “which were like movies in the sky.” The first vision was of the first Christians, singing and marching towards Heaven. They were dressed in white – their bodies glowing with light. The second vision was of another group of people also dressed in white. They held illuminated rosaries in their hands. The leader read from a book, and after meditating on the reading, they prayed an Our Father and ten Hail Marys. Mary explained that they were the first ones to whom she had given the Rosary. She wanted everyone to pray the Rosary like they were doing it. In the third vision, Bernardo saw a group of men dressed in brown robes. Mary explained that these were the Franciscans. “They received the Rosary from the hands of the first ones.” In the fourth vision, he saw a large group, as big as an army, of people in normal dress, all holding rosaries. Light radiated from their bodies, and they were beautiful. He wanted to join them and go with them even though he was not illuminated, himself. Bernardo only shared these visions with the priest, knowing that the church must approve them first. The priest gave Bernardo approval and permission to spread the visions. On July 8, 1980, an angel presented him with a vision of a prophecy. The angel told Bernardo to tell a certain woman how and when her brother would get released from jail because he was innocent. He had a message for another woman regarding her alcoholic father and brother and her own problems teaching in a communist school. Finally, the angel foretold that his own cousin would be assaulted and later killed. All of these prophecies came to pass exactly as the angel had described. On October 13, 1980, on the Feast of Our Lady of Fatima, a large glowing circle appeared above the ground in front of fifty people that had gathered to say the Holy Rosary. Everyone saw the light that came from the sky – a single ray – like a powerful spotlight that illuminated the circle in front of them. Then the people noticed that a circle had also formed in the sky. “It was like a ring around the sun – but it’s not the sun!” The circle began to radiate all the colors of the rainbow (at exactly 3:00 p.m.) – which danced about the sky. She appeared on her little cloud which rested above a pile of flowers that the group had brought. She extended her hands, and rays of light reached out to everyone, causing some to cry with joy. Bernardo begged her to appear to all of those present as they did not all believe in his vision. Mary’s face became pale and her clothes turned gray, appearing as Our Lady of Sorrows. As she departed, the little cloud seemed to be pushing her back up to Heaven. At this, the messages from Mary were completed. These six apparitions were officially approved by the church in 1982, and, shortly after that, Bernardo Martinez was ordained a priest. 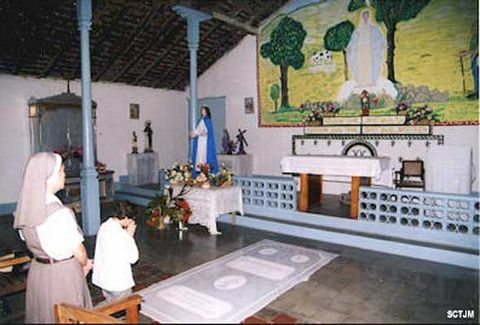 The local bishop, Monsignor Vega published his approval of these apparitions on November 13, 1983. Most of the 202,000 Nicaraguans who reside in the United States fled to this country in the 1980’s when the brutal war in Nicaragua broke out between the Sandinistas and the Contras.